The First Comic Book Superhero To Get Rebooted Into A New Character Was? Rebooting comic book characters and even entire comic book franchises is fairly commonplace these days, but once upon a time the process was unheard of. Unheard of, that is, until DC Comics rebooted The Flash and, in the process, ushered in the Silver Age of comic books. The original Flash was from 1940 and was an early and successful superhero in the Golden Age of comics. The Golden Age was a period of high comic readership in the late 1930s to the early 1950s marked by the introduction of the comic superhero archetype and many notable characters that still endure today like Superman, Batman, Captain America, and Wonder Woman. Toward the end of the Golden Age, there was a marked shift away from superhero-centered comics and many comic lines were discontinued and/or replaced with non-superhero comics. In 1956, DC Comics did something unprecedented: they reintroduced The Flash in Showcase #4 as a rebooted character. 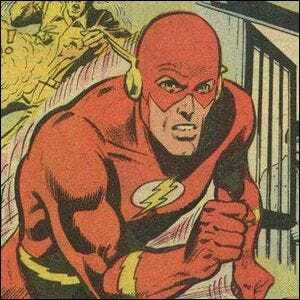 After a seven year hiatus (1949-1956) the Flash was back with a new identity, new backstory, and a new creation story. The new Flash, Barry Allen, named himself after the old Flash, Jay Garrick, in an interesting in-comic nod to Golden Age comics. In fact, in later comics in the series, DC Comics introduced the concept of parallel comic universes wherein the new Flash and the old Flash existed simultaneously and could use their super-speed Flash powers to shift between dimensions. The reboot proved so popular that other characters soon followed and the icons of the Golden Age of comics graced the printed page again.